We all remember how Google suppressed the data for companies with low Adwords budgets, leaving a number of businesses with very approximate data on searches. We would have thought it couldn’t get any worse. Nevertheless, the recent update to Google Keyword Planner proves that we’ve been going about this all wrong. These latest changes touched the Search Volume, key web metric that every business relies on when building a list of targeted keywords. Until recently, you could obtain search volume data for certain keywords by entering them into the search box at Keyword Planner. However, it doesn’t work this way now. 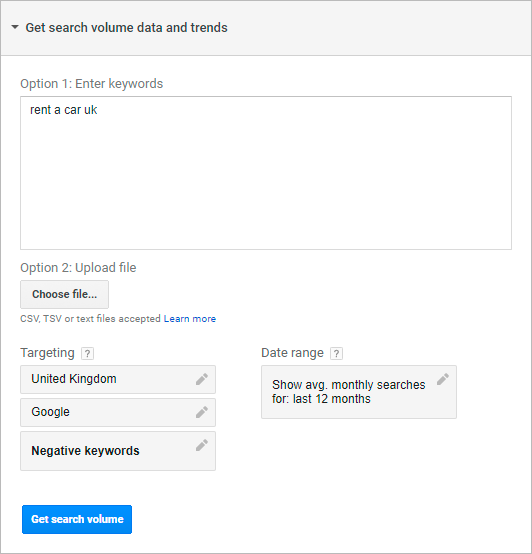 Here, you’d probably expect to see the search volume for “rent a car uk,” nonetheless you see the data for the relevant keyword “car rental uk” with some 18,100 average monthly searches, which is apparently too many for this particular keyword. We’ll tell you why this happens. Google has made a change to its Keywords Planner, where instead of displaying the data for each keyword individually, the numbers are now lumped together, what means that Google shows the cumulative data for the group of similar keywords. Simply put, Google combines search variants into a single whole. So, 18,100 is nothing but the number of monthly searches for broad match keywords. On the other hand, you can still get accurate data for a particular keyword. Specify a bid using the text box at the top of the page. Make sure your bid is high enough. Add a needed keyword to a new group. Remove the group containing the suggested keyword and select exact match. The value obtained is 338.08, and it clearly makes more sense. It should be pointed out that it’s the number of people that are, according to Google, likely to search for our keyword; that is, unlike a deceptive search volume it represents a real number of people typing in this particular keyword. Although you’ll need to round up and down these numbers to a certain degree, you can see that the keyword “rent a car uk” is nowhere near to 18,100 searches. As you see, search volume in AdWords is tricky. By passing off the broad match estimation for a group of similar keywords as the indicator of search volume for individual keywords, Google forces us to put a lot of time and effort into the process of keywords. Here, at DataForSEO we’ve developed a tool that can make this substantial part of SEO much more manageable. Meet the Ads Traffic for Keywords, the tool that will provide you with the full set of useful stats including daily impressions, CPC and clicks estimation. The data we provide is more accurate than regular search volume, which shows the broad match estimation for a group of similar keywords. What’s more, with DataForSEO you’ll get maximum, minimum and average values of all these metrics, what allows you to make the most accurate forecast for your keywords. You’ll also be able to predict daily impressions, CPC and clicks estimation for different platforms, such as desktop, mobile, and tablet.